Larger than life portraits capturing the personality, bravery, and narrative of the stories of women. 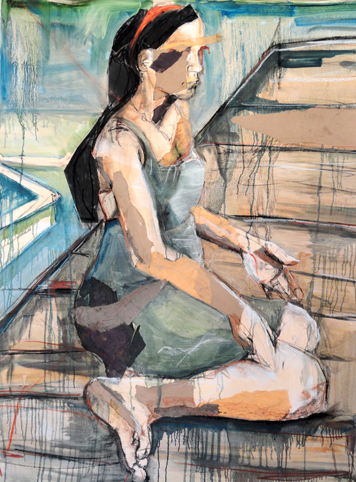 Glasser’s mixed media approaches to the figure allow for rich textures, abstract elements, and gestural components to each full figure drawing. We are our stories. Our bodies show proof of our battles through scars, winkles, and stretch marks: mere physical emblems of some of our struggles. Despite the wear and tear our bodies grow through, society continues to socialize women to look "beautiful" and behave deferentially. The portraits of women in this series pay tribute to bold and brazen women who have refused to confine themselves to societal gender constraints. Please visit the contact page for gallery inquiries & purchasing information.